Oxycalciopyrochlore: Mineral information, data and localities. First described by Černý et al. (1979) as stibiobetafite from Věžná I pegmatite, Moravia, Czech Republic. Renamed by IMA in 2010 according to the new nomenclature of the pyrochlore supergroup as oxycalciopyrochlore. 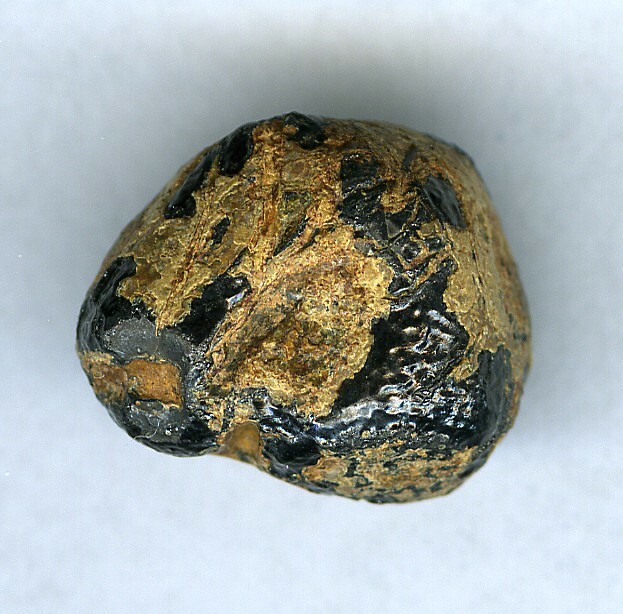 This page provides mineralogical data about Oxycalciopyrochlore. Approved by IMA in 1978 as stibiobetafite. Redefined and renamed by IMA in 2010 as oxycalciopyrochlore. It turns pale orange after heating at 700°C for 1 h in air. Discrete octahedra, or as granular aggregates. Titan-uranoan Oxycalciopyrochlore Some specimens of former Betafite (of Hogarth 1977) had turned out Titan-uranoan Oxycalciopyrochlores with contents of UO2 up to 24.7 mas.% and ThO2 3.2 mas.%. Černý, P., Hawthorne, F.C., Laflamme, J.H.G., and Hinthorne, J.R. (1979) Stibiobetafite, a new member of the pyrochlore group from Venzá, Czechoslovakia. The Canadian Mineralogist: 17: 583-588. Černý, P., Hawthorne, F.C., Laflamme, J.H.G., Hinthorne, J.R. (1979) Stibiobetafite, a new member of the pyrochlore group from Venzá, Czechoslovakia. 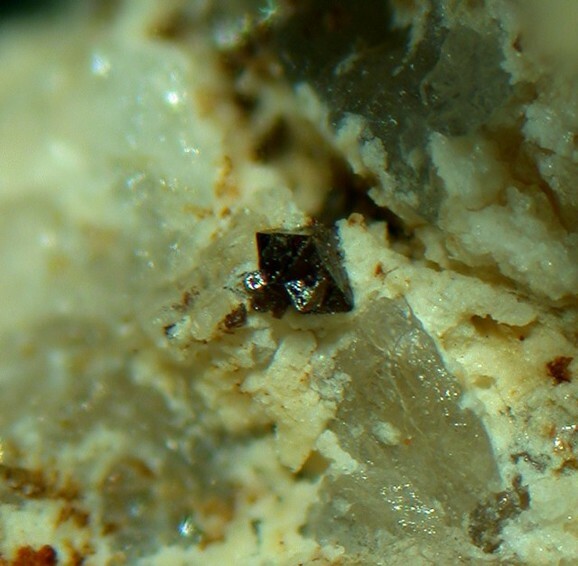 The Canadian Mineralogist: 17: 583-588.; Atencio, D., Andrade, M.B., Christy, A.G., Gieré, R., Kartashov, P.M. (2010) The pyrochlore supergroup of minerals: nomenclature. The Canadian Mineralogist: 48: 673-698. Anthony, et al. (1997) Handbook of Mineralogy, v. 3, p. 106. Williams, C.T. (1996): The occurrence of niobian zirconolite, pyrochlore and baddeleyite in the Kovdor carbonatite complex, Kola Peninsula, Russia. 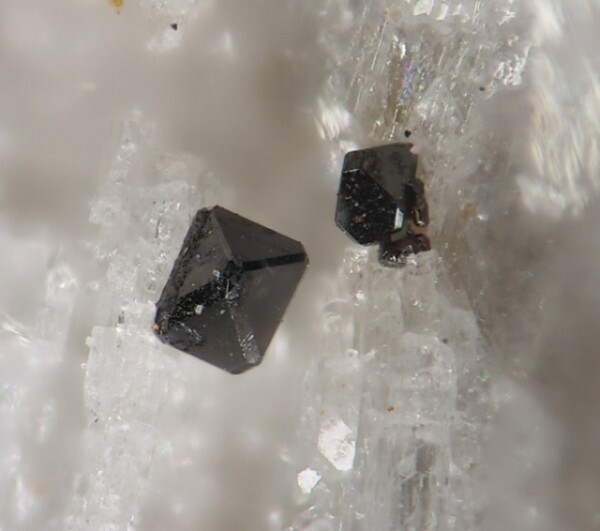 Mineralogical Magazine: 60: 639-646; Atencio D., Andrade M.B., Christy A.G., Giere R., Kartashov P.M. (2010) The pyrochlore supergroup of minerals: nomenclature. The Canadian Mineralogist: 48: 673-698. Chukanov, N.V., Skrigitil, A.M., Kuzimina, O.V. & Zadov, A.E. (1999): Bismutopyrochlore (Bi,U,Ca,Pb)1+x(Nb,Ta)2O6(OH)•nH2O – a new mineral from the Mika pegmatite vein (eastern Pamirs). Zapiski Vsesoyuznoye Mineralogichestogo Obshchestvo: 128(4):36-41; Atencio D., Andrade M.B., Christy A.G., Giere R., Kartashov P.M. (2010) The pyrochlore supergroup of minerals: nomenclature. The Canadian Mineralogist: 48: 673-698. Mokhov, A.V., Kartashov, P.M., Bogatikov, O.A., Ashikhmina, N.A., Magazina, L.O. and Koporulina, E.V. (2008) Fluorite, hatchettolite, calcium sulfate, and bastnasite-(Ce) in the lunar regolith from Mare Crisium. Doklady Earth Sciences, 422(1), 1178-1180.